Based on the frontal airbag OOP injury data, the Technical Working Group (TWG) believes neck injuries will be the most critical out of position (OOP) injury risk from side airbags. 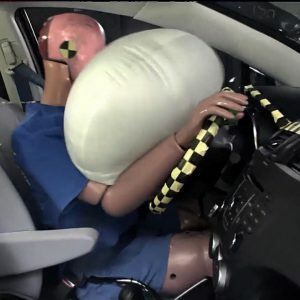 Experience with frontal airbags indicates that rupture of the connective tissues between the head and neck (occipital condyles – atlas region) is a primary cause of the fatalities observed among OOP children and adults. Accordingly, the TWG considered a number of neck injury indicators that can be measured at the upper neck load cells of the dummy necks. the upper neck load transducer located at the dummy’s head/neck interface, occipital condyles. Limit values for these measurements were proposed by AAMA (1998) for OOP assessment of frontal airbags. injury/dummy response correlation data of Mertz et al. (1982) and Prasad and Daniel (1984). neck injury below the proposed 2 percent limit line. peak neck tension (Mertz et al., 1997), the Alliance proposed to limit peak tension and peak compression. The limits for peak neck tension were set at 3 percent risk of AIS ≥3 neck injury. 208 for regulating the OOP performance of frontal airbags. Nij limit lines and the peak tension and peak compression limit values are given in Table 2.
appropriate countermeasures should be pursued.